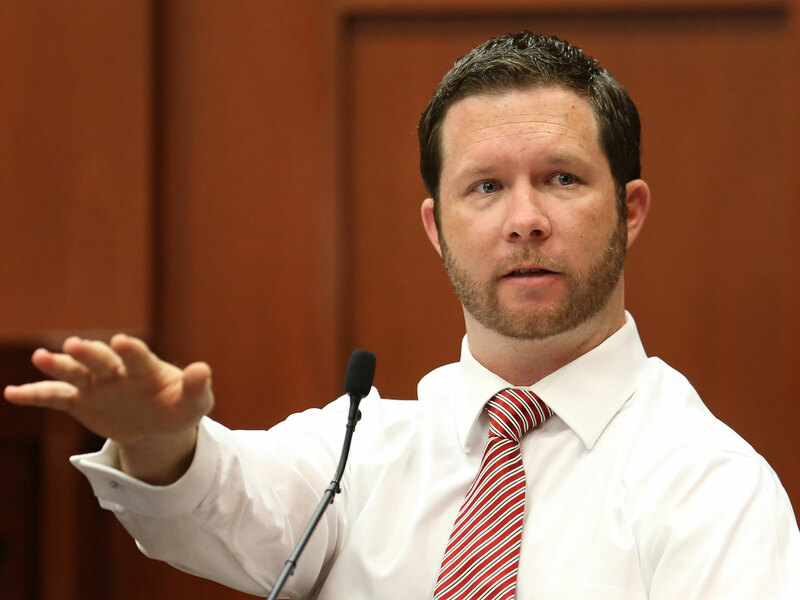 John Good took the stand Friday in the fifth day of testimony in the Zimmerman's second-degree murder trial. The former neighborhood watch captain is charged with shooting the unarmed teen as he was walking back to his father's fiancee's home through a Sanford, Fla. gated community. John Good testified he saw a man in dark clothing on top of a man who was wearing red or light-colored clothing with lighter skin. Zimmerman, 29, was wearing a red jacket the night of the altercation, and Martin was wearing a dark hoodie. However, Good testified that he didn't see the person on top smashing the other person's head into the sidewalk, as Zimmerman claims Martin did before he fatally shot the teen. Taking the stand Friday, John Good said he was at home watching television with his wife when he heard a "faint noise" that seemed to be getting closer. Outside, he said he saw the person on top of another man. The man on the bottom, who he said he now believes is George Zimmerman, yelled for help. "At first it was "What's going on," and no one answered,' " Good said, describing calling out to the men. "And then at that point the person on the bottom, I could finally see, I heard a 'help.' Then at some point I said 'Cut it out.' And then, 'I'm calling 911.' That's when I thought it was getting really serious." The altercation seemed to escalate, according to Good. The struggle moved to the cement pathway, and he said the person in dark clothing straddled the other man in "mixed martial arts position" he later described to police as a "ground and pound." He said he saw "arm movements going downward," though he couldn't be certain the person on top was striking the person on the bottom. "The person you now know to be Trayvon Martin was on top, correct?" asked defense attorney Mark O'Mara. "He was the one raining blows down on George Zimmerman, correct?" "That's what it looked like," Good answered. "I just heard a shot right behind my house. They're wrestling right in back of my porch," Good said on the recording. "...I'm pretty sure the guy's dead out here. Holy sh--." Later, prosecutor Bernie de la Rionda asked whether it was possible a police officer could have used the term "ground and pound" before he did. De la Rionda honed in on Good's earlier statement that he couldn't confirm the person on top was hitting the other person.